The members of this tree are based on the Heimskringla, an account of the lives of the Norwegian kings, which was written in Iceland in the mid 13th century and based on oral traditions, poems and ballads, but also manuscripts. It starts with the mythical god Odin, who is described as a mortal man, and continues with the sagas of individual rulers, blending fiction into fact over its centuries-long span. The accuracy of the early characters can therefore not be guaranteed, but most historians agree that the later sagas are based on real events. It is believed that the genealogies of the main characters have often been adapted to fit into a continuous narrative. The importance of the family studied here goes beyond the relatively insignificant Earls of Orkney, as they are said to be the progenitors of a great family. The Norwegians claim that they spawned the Dukes of Normandy and, since most modern historians tend to support this version, I have based their genealogy on this premise (see Origins). 1. Øystein IVARSSON “the Noisy” born c810 Oppland, Norway, died c894, married Aseda RAGNVALDSDATTER born c830 Vestfold, Norway. 1.1. Ragnvald ØYSTEINSSON Earl Møre og Romsdal, Earl of Orkney, born c825, died 898 Giske, Møre og Romsdal, Norway, had children by Unknown UNKNOWN, married Ragnhild ROLVSDATTER (daughter of Rolv NEVJA) born c826, died c890. 1.2. Sigurd I ØYSTEINSSON Earl of Orkney, died c880 Burghead, Moray, Scotland, married Jocunda of DENMARK. 1.3. Svanhild ØYSTEINSSDATTER born Oppland, Norway, died Oppland, Norway, married King Harald of NORWAY “Fair Hair” (son of Halvdan GUDRØDSSON and Ragnhild SIGURDSDATTER) born c850 Vestfold, Norway, died c933 Avaldsnes, Rogaland, Norway. 1.1.1. Einar RAGNVALDSSON “Turf Einar”, Earl of Orkney, born 852 Møre og Romsdal, Norway, died 910 Orkney Islands, married Unknown UNKNOWN. 1.1.2. Hallad RAGNVALDSSON Earl of Orkney. 1.1.4. Ivar RAGNVALDSSON died childless. 1.1.5. Rollo RAGNVALDSSON “Gange Rolf”, 1st Duke of Normandy, born c860, died c932 Rouen, Normandy, married 1st Poppa de BAYEUX born c882 Bayeux, Normandy, died c932, married 2nd Giselle of FRANCE (daughter of Charles III of FRANCE “the Simple”). 1.1.6. Tore RAGNVALDSSON Earl of Møre og Romsdal married Alov Arbot of NORWAY (daughter of King Harald of NORWAY “Fair Hair” and Gyda EIRIKSDATTER). 1.1.7. 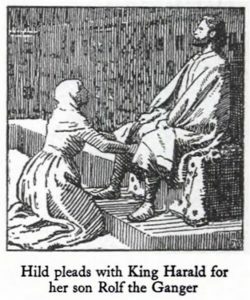 Hilda RAGNVALDSDATTER married Sigurd Rise of NORWAY (son of King Harald of NORWAY “Fair Hair” and Snøfrid FINNSDATTER). 1.2.1. Guttorm SIGURDSSON died childless. 1.3.1. Bjørn HARALDSSON born Vestfold, Norway, died c932, married Unknown UNKNOWN. 1.3.2. Olaf HARALDSSON died 934.married Unknown UNKNOWN. 1.1.1.1.Torfinn EINARSSON “Skull Splitter”, Earl of Orkney, born 890 Orkney Islands, died 976 Orkney Islands, buried Hoxa, Orkney Islands, married Grelod of CAITHNESS (daughter of Duncan of CAITHNESS) born 898 Caithness, Scotland, died 941 Orkney Islands. 1.1.1.2. Arnkjell EINARSSON died 944. 1.1.1.3. Erlend EINARSSON died 944. 1.3.1.1. Gudrød BJØRNSSON died Tønsberg, Vestfold, Norway, married Unknown UNKNOWN. 1.3.2.1. 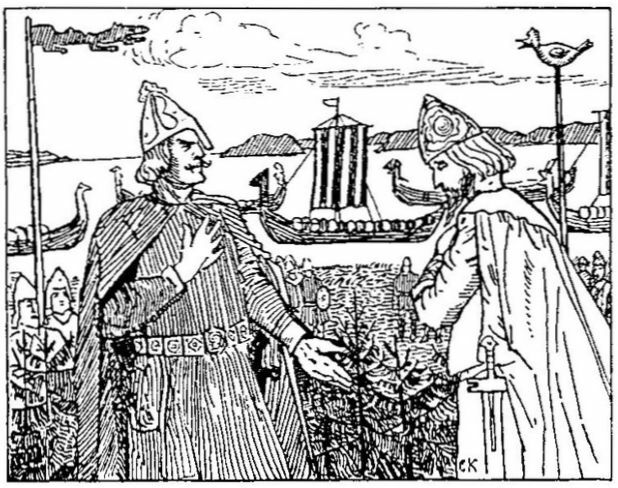 Tryggve OLAFSSON died 963, married Astrid EIRIKSDATTER. 1.1.1.1.1. Arnfinn TORFINNSSON Earl of Orkney, married Ragnhild of NORWAY (daughter of King Eirik of NORWAY and Gunnhild OSSURSDATTER). 1.1.1.1.2. Håvard TORFINNSSON Earl of Orkney, married Ragnhild of NORWAY (daughter of King Eirik of NORWAY and Gunnhild OSSURSDATTER). 1.1.1.1.3. Ljot TORFINNSSON Earl of Orkney, married Ragnhild of NORWAY (daughter of Eirik of NORWAY and Gunnhild OSSURSDATTER). 1.1.1.1.4. Skule TORFINNSSON Earl of Caithness. 1.1.1.1.5. Lodve TORFINNSSON Earl of Orkney, born Orkney Islands, died 988 Orkney Islands, married Audna KJARVALSDATTER. 1.3.1.1.1. Harald GUDRØDSSON married Åsta GUDBRANDSDATTER (daughter of Gudbrand KULA) born c977, died c1025. 1.3.2.1.1. King Olaf I of NORWAY. 1.3.2.1.3. Ingebjørg TRYGGVESDATTER married Ragnvald ULFSSON Earl of Götaland, Earl of Ladoga (son of Ulf TOSTESSON and Ingeborg UNKNOWN) born Götaland, Sweden. 1.1.1.1.5.1.Sigurd II LODVESSON “the Stout”, Earl of Orkney, born c950, died 29 April 1014 Clontarf, Leinster, Ireland, married 1st Thora of NORWAY (daughter of King Håkon of NORWAY) married 2nd Olith of SCOTLAND (daughter of King Malcolm II of SCOTLAND). 1.3.1.1.1.1. 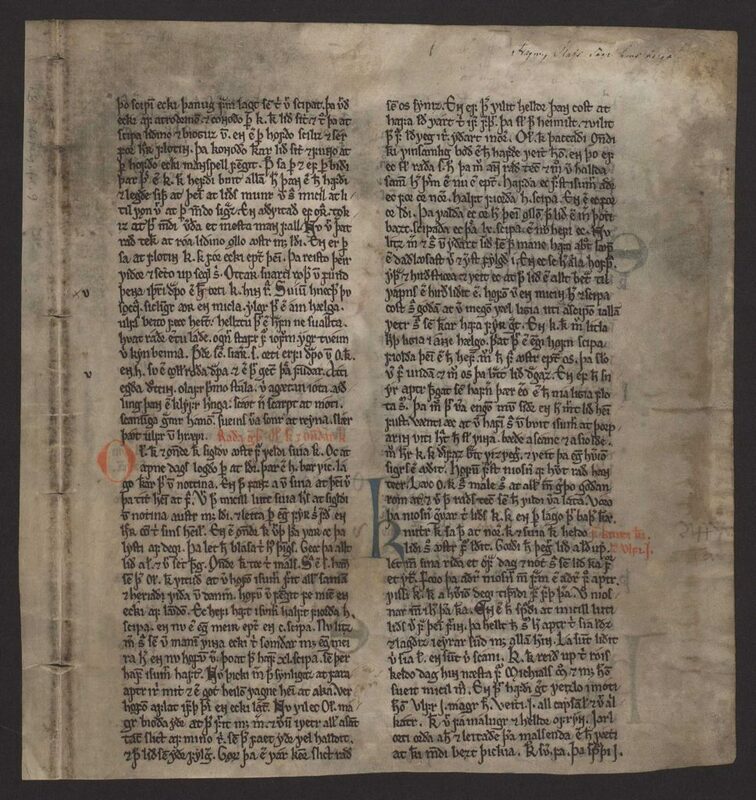 Olaf II of NORWAY born 995, died on 4 August 1028 battle of Stiklestad, Trøndelag, Norway, married 1st Unknown UNKNOWN married 2nd Astrid of SWEDEN (daughter of Olof of SWEDEN and Edla). 1.1.1.1.5.1.1. Whelp SIGURDSSON died before 1014 Norway. 1.1.1.1.5.1.2. Sumarlide SIGURDSSON born 990, died c1016, no issue. 1.1.1.1.5.1.3. Bruse SIGURDSSON born c987, died c1033, married Unknown UNKNOWN. 1.1.1.1.5.1.4. Einar SIGURDSSON born 1000, died c1021. 1.1.1.1.5.1.5. Torfinn SIGURDSSON born 1009, died 1064, married Ingebjørg FINNSDATTER (daughter of Finn ARNESSON and widow of Malcolm III of SCOTLAND) died in 1070. 1.3.1.1.1.1.1. Magnus of NORWAY born c1024, died 31 October 1047. 1.1.1.1.5.1.3.1. 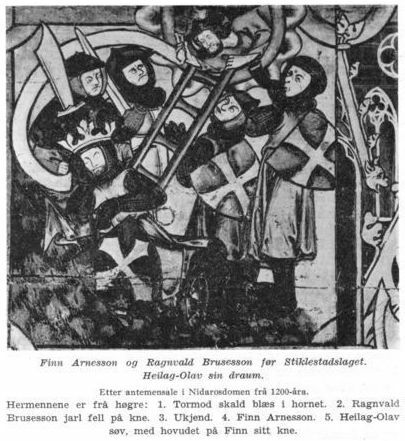 Ragnvald BRUSESSON born c1012, died 1046 Orkney Islands, married Ostrida RAGNVALDSDOTTER (daughter of Ragnvald ULFSSON Earl of Götaland and Ingebjørg TRYGGVESDATTER) born 990 Götaland, Sweden, died 1010 Orkney Islands. 1.1.1.1.5.1.5.1. Erlend TORFINNSSON fought alongside Harald Hardråda at the battle of Stamford Bridge 1066. 1.1.1.1.5.1.5.2. Pål TORFINNSSON fought alongside Harald Hardråda at the battle of Stamford Bridge 1066. Biographical details available on request.